Zero Liquid Discharge Systems Market size valued at USD 6 billion in 2018 and will grow at a CAGR of over 5.5% from 2019 to 2025. 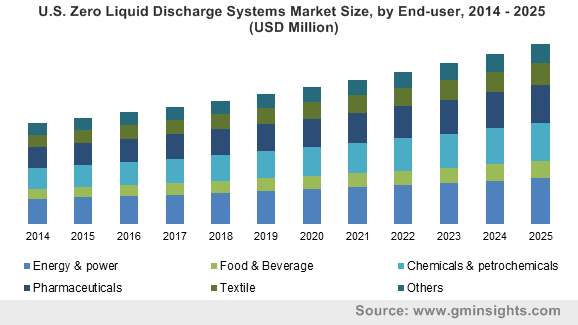 Growing need for clean & consumable water coupled with rising concerns for water decontamination will propel the zero liquid discharge systems market demand by 2025. Increasing government initiatives for implementing wastewater treatment facilities in most of the industries generating maximum wastewater from their plants will boost the demand for ZLDs in the forecast period. Zero liquid discharge is type of wastewater treatment technology where it purifies and recycles the waste water without discharging any liquid at the end of the procedure. Surge in industrialization globally has increased the level of pollution in the ecosystem and in turn minimize the potable water level. Moreover, the escalating dumping of brine concentrates into the water bodies will generate a profuse need for zero liquid discharge systems during the projected timespan. Authoritative bodies around the globe are imposing stringent regulations and guidelines regarding the discharge of wastewater, that will fuel the creation of numerous wastewater plants globally. Regulating organizations such as European Water Association (Europe), Environmental Protection Agency (United States), India Water Works Association (India) and China Water Risk (CWR) are vigorously involved in regulating and controlling the wastewater disposal and expulsion. For instance, the Union Environment Ministry of India from 2016 has imposed mandates for setting up ZLD units for several industries such as fertilizers, paint, sugar, pulp and paper, thermal power plants, slaughterhouses, textiles, brick kilns, common effluent treatment plants, coffee, sewage treatment plants etc. These increasing endeavors towards the conservation of fresh water and treatment of wastewater will positively drive the zero liquid discharge systems market size in the expected timeframe. High initial set up and operating cost of the ZLD plant or system will be a key restraining factor for market growth in future. The ZLD systems requires a skilled professional to operate the plant owing to its complex procedures and the unit also requires a large space to accommodate. Nevertheless, increasing awareness and strict regulations pertaining wastewater disposal will swell the product industry size by 2025. Based on product type, the zero liquid discharge systems market is segmented into two categories i.e. conventional and hybrid units. The conventional ZLDs are based on evaporation and crystallization operations. These plants helps in filtering highly soluble salts, such as ammonium and calcium chlorides, and certain heavy metal salts that can’t be crystalized without evaporating. The segment accounted for over 50% market share in 2018 and is expected to hold a major share in the future. The conventional ZLD disposes the solid wastes that can be used as by products that are reused or sold as an industrial processes. Zero liquid discharge systems market has been classified into thermal based and membrane based technology. The membrane based segment will grow at a significant CAGR over 5.5% in the near future. The hybrid based ZLD process comprises a pre-treatment unit with brine filtration, trailed by a RO pre-concentration and further purification in a falling film MVR evaporator. This process is then concluded by a crystallizer and a solid separator, that produces potable water for the re-use in the manufacturing facility. 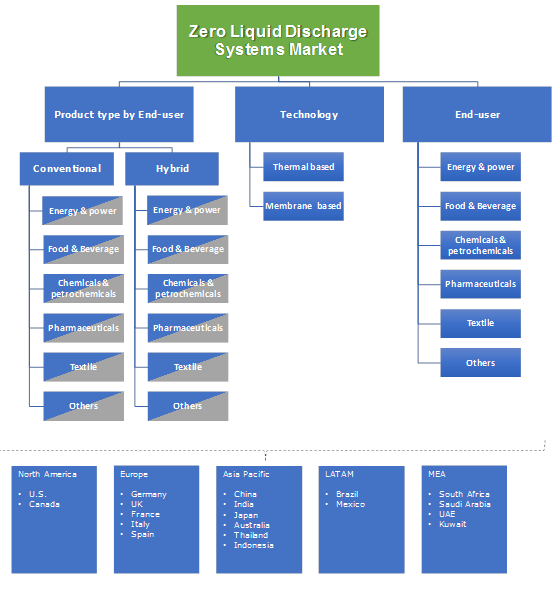 The zero liquid discharge systems market is further segmented into energy & power, food & beverage, chemicals & petrochemicals, pharmaceuticals, textile and some other end-users. The others segment consists of electronics & semiconductors, automotive etc. Chemicals & petrochemical industry is projected to grow with the highest CAGR around 6% in future. It is one of the highest water consuming industry globally. Therefore, evolving regulations regarding wastewater discharge and freshwater scarcity are augmenting the demand for ZLD and high water recovery solutions. North America held a major chunk in the zero liquid discharge systems market owing to the gradual increasing population and industries coupled with surge in water & sewage treatment facilities. The segment is said to grow with a significant rate of over 5% in the projected timeframe. Asia Pacific proved to be the fastest growing region in the global zero liquid discharge systems market and will continue to grow at a highest CAGR over 8.5% in future. Increasing industrialization and a large number of population is creating a big deficit in the amount of freshwater. The industries in the region are responsible for producing large amounts of sewage, that will enhance the regional market demand in the coming years. The key competitive players functioning in the zero liquid discharge systems market are Veolia Water Technologies, Aquatech International LLC, GEA Group, Suez SA, ALFA LAVAL, U.S. Water Services, Inc., H2O GmbH, Oasys Water, Praj Industries, AQUARION AG, Kelvin Water Technologies Pvt. Ltd., ENCON Evaporators, Austro Chemicals & Bio Technologies Pvt Ltd., SafBon Water Technology and IDE Technologies. The companies in this industry are adopting key strategies for capturing regional markets in order to expand their business operations in different countries across the globe. For instance, in October 2015, Aquatech secured ZLD project for Chinese coal-to-liquids plant. The system designed by Aquatech can recycle over 55 million liters waste water per day. Zero liquid discharge systems market is expected to witness a very high growth in the near future due to the swelling number of industrial operations worldwide. Mounting industrial activities leads to the formation of sludge, brines, salts and sewage which will further fuel the product demand. Governments in many nations have formed specific guidelines for the recycling and purification of industrial sewage and waste water treatment, that in turn will augment the global market size by 2025.